The dream began more than 30 years ago about building a new pool for everyone in the community and visitors alike. It was back in 1978, using Park Bond Act monies obtained a 5 acre parcel known as Green Memorial Field in central Fort Bragg. It took many years of fundraising and in addition large donations from local resident Harry Spath, and the Starr Foundation that construction began in 2006. 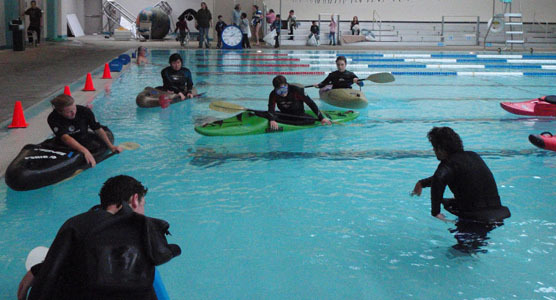 In a course of 3 years and 25 million dollars in August 2009, the C. V. Starr Community Center and Sigrid and Harry Spath Aquatic Facility opened to the public. In March 2012, the city of Fort Bragg partnered with the Mendocino Coast Recreation and Park District (MCRPD), and with the passage of Measure A, the C. V. Starr Center operation and Maintenance was fully funded by the half-cent sales tax. The C. V. Starr Center is owned by the city of Fort Bragg and operated by the Mendocino Coast Recreation Park District in accordance with the operating agreement between the 2 entities. Starting with the facilities outside the C. V. Starr propertyyou will find what every community wants or needs is a skateboard park which is opened in November of 2010 and is the perfect place to practice and sharpen your skills. 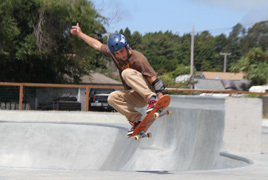 The skate park is FREE, and open to the public from 9:00 am – sunset. Full protective gear is required, and bicycles are not permitted. Park patrons who skate without helmets and pads risk receiving hefty fines from local police who regularly patrol the park. Click here for skate park rules and regulations. 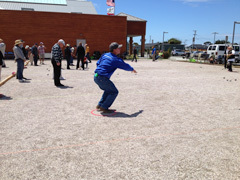 In addition the C. V. Starr Community Center also offers multiple petanque courts. You will find such clubs like the Noyo Yoyos that get together every Thursday afternoon, beginning at 2:00 pm. Also for mans best friend is the new off-leash dog park which is located at the northeast corner of the property. There are 2 fenced areas for large and small dogs to run around in. Plus you will find a barbeque picnic area which has 3 charcoal grills, with seating for 50 people. The large grassy area also has a horseshoe pit. 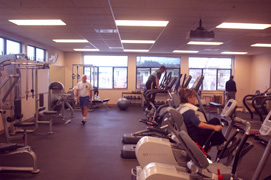 Their newly remodeled weight training and cardio fitness center, offers a 500 square foot free weight station with equipment for cardio such as treadmills, stairsteppers, elliptical machines, and bikes. There weight machines include leg press, leg extension/curl, inner/outer thigh, biceps/triceps, shoulder press, bench press, last pull down, seated row, adjustable cable and attachments. Their free weights include squat rack, bench press, preacher curl, weight benches, dumbbells up to 100 lbs., swiss balls, bosu balls, medicine balls, plyometric boxes and resistance bands. There are 2 exercise studios. 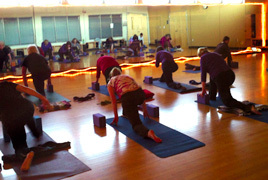 Their dance/aerobics room was designed with high-energy group exercises that offers hardwood flooring, mirrored walls with a state of the art sound system with the capacity for over 30 participants. Also they have a multipurpose exercise room that regularly hosts 18 star trac spin bikes, yoga, Pilates, Zumba and youth movement-based fitness classes. The C. V. Starr Center offers two pools. The Leisure Pool which features a 164 foot water slide and lazy river. Also the Lap Pool which has 8 lap lanes and a diving board. They have an abundance of water related activities and services, centered around their 2 indoor pools. Also for a fee they offer swimming lessons and lifeguard training. They also offer services such as FREE WI-FI available inside the building, and also the KIDS CORNER for your 18 month to 5 years which they will have a fun with creative programs for your youngster to enjoy while you use the facility. They are located at 300 South Lincoln Street, Fort Bragg, California. 707-964-9446. This entry was posted in Mendocino Attractions and tagged C. V. Starr Community Center, cardio fitness center, dog park, exercise studios, fort bragg, free wi-fi, Harry Spath, Harry Spath Aquatic Facility, kids corner, lap pool, lazy river, leisure pool, Mendocino, Mendocino Coast Recreation, petanque courts, picnic area, pilates, skate park, Starr Foundation, water slide, weight training, yoga classes, youth fitness classes, zumba.